Announcing a new display installed in the Wade Center’s museum in May, featuring correspondence between Charles Williams and his publisher Victor Gollancz: “Charles Williams and Victor Gollancz: The Story of a Publishing Team.” This is the second post this month on Charles Williams, in memory of the 70th anniversary of his death on May 15, 1945. The letters in the display come from a collection of correspondence deposited at the Wade Center by Brian and Sally Oxley. 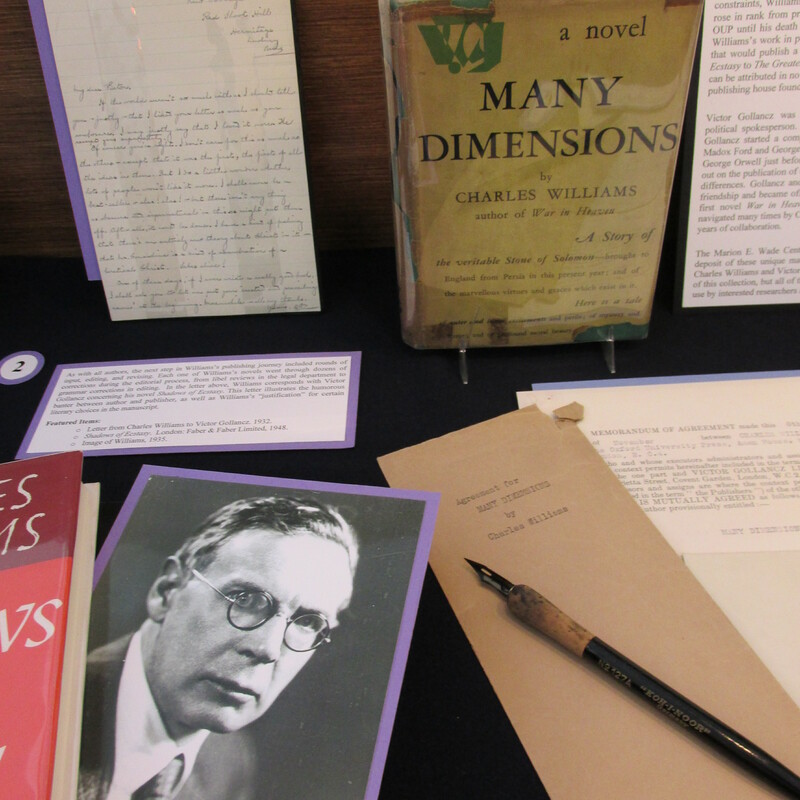 The Wade Center is grateful to the Oxleys for these unique materials, and the story they share relating the publication history of Williams’s works. The full letter collection on deposit is listed in the Charles Williams Papers finding aid, folders 492 to 498. Wade Center visitors may view these and other collections in the Reading Room. This collection of letters gives an intriguing look into Williams’s relationship with Gollancz, and offers background into their collaborative efforts to bring Williams’s work to print. In one instance, Gollancz comments that the name for one of Williams’s manuscripts, The Corpse, must be changed: “Anyone … would immediately think it to be a detective story: and this would have the double disadvantage of limiting the market on the one hand and of deceiving the purchaser on the other.” (Gollancz to Williams, March 19, 1930). The novel was later renamed War in Heaven. In another anecdote, a displeased school master writes to the publisher about a “mass of misprints” in The New Book of English Verse. Yet when pressed, the school master could only produce a list of three typos. Norman Collins, an associate at Gollancz who would go on to become a famous BBC program creator, writes a note to Williams on March 10, 1936 saying: “it seems really contemptible that a man should complain of three misprints … in a book of over 800 pages. I would propose writing back in a more or less abrupt fashion.” Letters and various documents relating to each work Williams published with Gollancz (in the list above) are highlighted in the display, including a publishing contract for Many Dimensions, a letter from Williams’s wife (Florence ‘Michal’ Williams) to Gollancz, and copies of the books themselves. 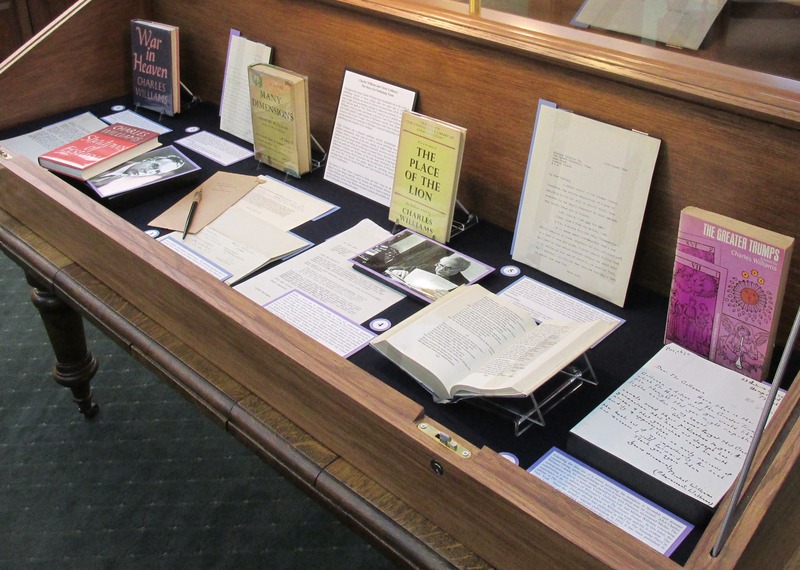 Our sincere thanks go to Wade Student Worker and Archives Assistant, Basye Peek for her work in organizing the letters to make the collection available for researchers, as well as the letter selection, design, and caption writing for this display. 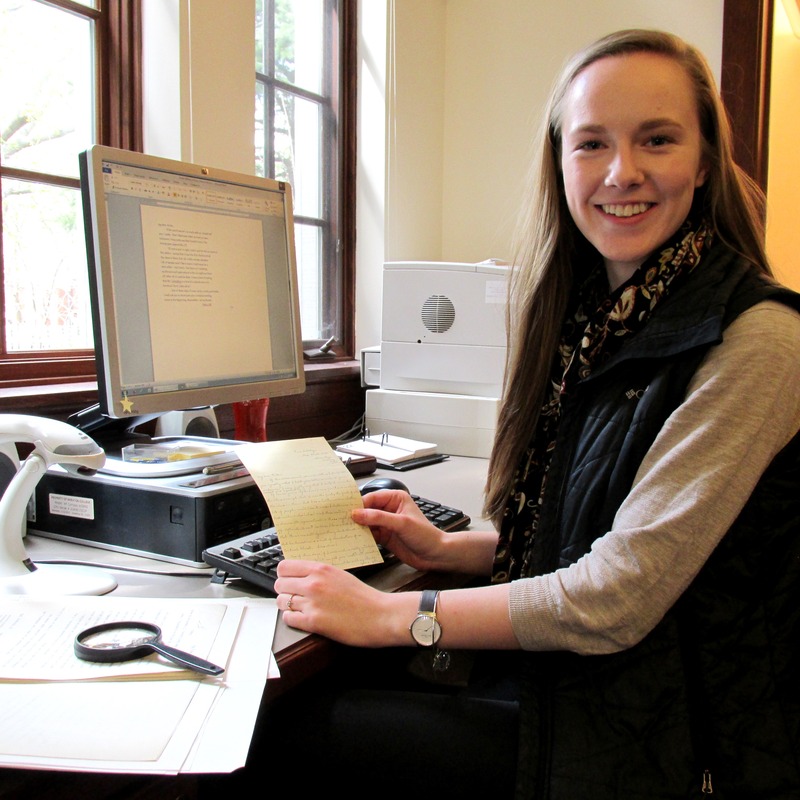 Basye just completed her freshman year as an anthropology major at Wheaton College; she began working at the Wade Center in the fall of 2014. Thank you, Basye!